Earlier today, Bleeding Cool was the first to point the finger at the unprecedended success enjoyed by the first issue John Layman and Rob Guillory’s Chew from Image Comics. When was the last time the first issue of a new series was hitting $50 on eBay two weeks later? Not with Bone, not with Ultimate Spider-Man, not with the Obama/McCain books from IDW. This has never happened before. And as retailers rush to up their orders on the second print and the second issue, there are all sorts of knock on effects. 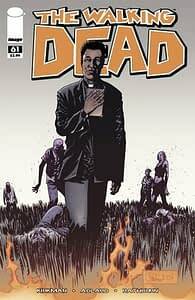 Walking Dead #61 featured a preview of the series, and is itself now selling out and rising up the eBay charts. Could other series by John Layman, languishing in 50c bins up and down the country, received similar favour? Bay City Jive perhaps? Xena Warrior Princess? Marvel Zombies Vs Army Of Darkness? Gambit? Puffed? Come on, admit it, who actually saw this coming? Hmm?